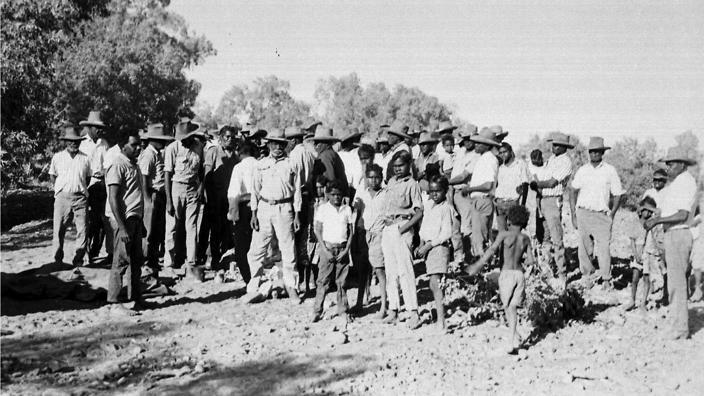 A short history of the Wave Hill, or Gurindji, strike, when aboriginal agricultural workers walked out for equal pay and then lodged a claim for the land they worked on. They remained out for an incredible nine years, and were eventually given back a proportion of the land. The Gurindji Aboriginal people were claiming that this land was morally theirs because their people “lived here from time immemorial and [their] culture, myths, dreaming and sacred places have been evolved in this land”. This was the first claim for traditional Aboriginal land in Australia. While Vestey’s company was prepared to hand the land over, opposition to this unusual and new idea was very strong. The strike went on for 9 years until Prime Minister Gough Whitlam visited the site of the strike and made history with a symbolic gesture - pouring soil into the hand of aboriginal elder Vincent Lingiari. Gough Whitlam pouring soil into Vincent Lingiari’s hands has become a defining moment in Australia’s history. “It would be fair to assume that today – 50 years after the walk-off and 40 years after the passage of the federal land rights act – the situation has massively improved and that the problems raised half a century ago have been fixed. But has the situation really improved? Body Snatchers- The Theft of Radical's Body Parts.